Ronald D Green, 82, went to be with his Savior on September 21, 2016. He was born October 20,1933, in Salineville, Ohio, to Leona (Bauman) and Howard Green. 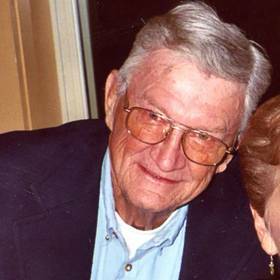 He grew up in Wellsville, Ohio, and graduated from Wellsville High School in 1951. He was a wonderful husband, father, grandfather and great grandfather. On December 27,1952, he married Jane Ann Hargreaves, also from Wellsville. They were married 64 years and had five children: Julia, Rhonda, William, Kelly, and Robert. After graduation, Ron attended DeVry University in Chicago while working full time at American Can Company. Crosley Avco in Cincinnati offered him a job and also paid his tuition so he could finish college at University of Cincinnati, where he got his degree in Electronics. He also worked at Dayton Associates before moving to the Detroit area in 1962. 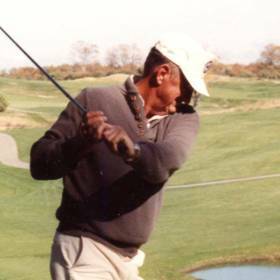 While delivering a computer system to Traverse City in 1969, he purchased the Acme Public Golf Course and moved his family to Acme from Livonia. He loved running the course, working outside, and meeting new people. After selling the Acme course, he and his son Bill built Green Hills Golf Course on Silver Lake Road. Following that, he worked at many golf courses in the area. Among them were Veronica's Valley, Matheson Greens and Grandview. His last place of employment was Home Depot. If anyone came in the store and told him what they were working on, he knew just what they needed and where to find it. Ron had integrity, and he was a very hard worker. He could do just about anything. After his career in electronics and golf courses, he worked in construction. He worked for Olie Ritola building and remodeling houses. He also built houses for his kids and grandkids and helped with many remodeling projects. He and his grandson Mark built the house that he and Jane lived in for the last 18 years. He was always willing to help anyone with anything. Surviving Ron is his wife, Jane; daughters Julia (Doug) Slack, Rhonda (Marc) Carroll, Kelly (Mike) Shrift and son Bill. Grandchildren Ron (Ruth) Hanna of Petoskey, Tracey (Jonathan) Dennis of Tustin, Mark (Kate) Hanna of Homewood Illinois, Ashley Carroll of Sault Ste Marie, Ontario, and Alison Shrift of Castle Rock, Colorado. Great grandchildren Steven, Lydia and Lucas Hanna; Madelynn, Abigail, Isaiah and Jake Dennis; Dyllan, Quinn, Cooper and Ellery Hanna. Brothers-in-law Robert Hargreaves, Jerry and John Arnette, sister-in-law Mary Ann DeGarmo, and special long¬time friend Norm Wyckoff. Proceeding Ron in death were his parents, Leona (Tom) LaScola and Howard (Elizabeth) Green; in-laws James Hargreaves and Mildred (Sam) Arnette; brother, William Green; brothers-in-law William Hargreaves and Rick Arnette; son-in-law Jerry Hanna; and infant son, Robert Green. Ron has been cremated, and a memorial service will be held at a later date. Burial will be at Springhill Cemetery in Wellsville, Ohio. Please visit www.lifestorytc.com to sign the guest book and share a message with the family. The family chose Life Story Funeral Home, Traverse City.